Because I have passed on attending my daughter’s school auction four years in a row, I donated a handmade baby quilt made-to-order, to assuage my guilt. It has been really interesting making something to another person’s taste. Teal, gray, and black? Really? I tried for some red, some orange, some yellow, but the quilt recipient knows what she wants. 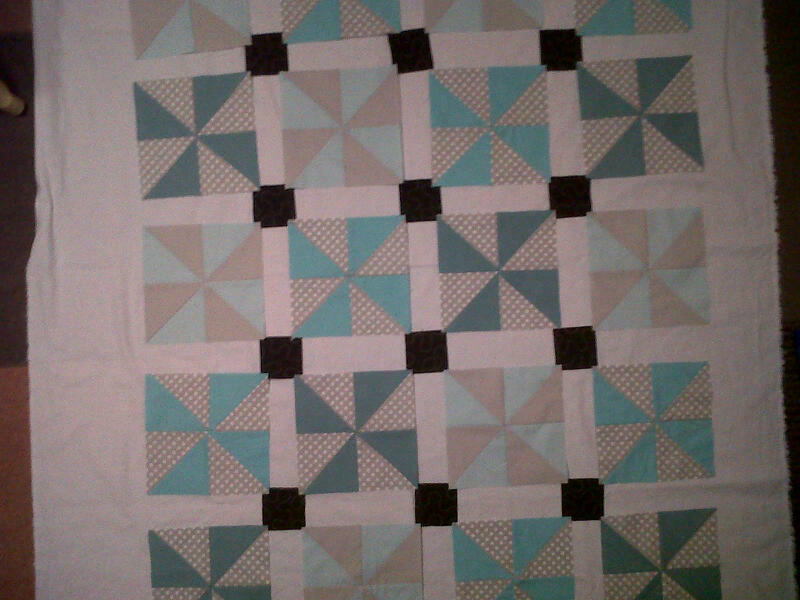 So, here is a bad picture of the quilt top, before sewing it up. It’s much more traditional than something I would usually make, but have to say I’m pretty pleased. It looks so quilty! The pattern is adapted from Quilting for Peace. I love this book, and the principle behind it. This is as close as I’ve come to a charity quilt, but I’m inspired! Nicely done, B.! You’ve managed to soften the black, teal, and gray to baby-friendly pastels, I think. You’ve certainly earned yourself a guilt-free pass to any future school auctions! Thanks! I love a guilt-free pass.